Aenne Bauksiepe was a German politician of the CDU party. Her maiden name was Engels. 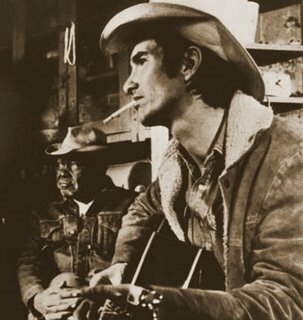 John Townes Van Zandt, better known as Townes Van Zandt, was an American singer-songwriter. He wrote numerous songs, such as "Pancho and Lefty", "For the Sake of the Song", "Tecumseh Valley", "Rex's Blues", and "To Live is to Fly", that are widely considered masterpieces of American folk music. His musical style has often been described as melancholy and features-rich, poetic lyrics. During his early years, Van Zandt was respected for his guitar playing and fingerpicking ability. Leighton Edward Buckwell was a provincial level politician from Alberta, Canada. He served as a member of the Legislative Assembly of Alberta from 1967 to 1975 sitting with the Social Credit caucus in government and opposition. Randy Craig Wolfe, known as Randy California, was a guitarist, singer and songwriter and one of the original members of the rock group Spirit, formed in 1967. Hédi «Balha» Berkhissa was a Tunisian footballer who played for Espérance and the Tunisian National Team as a defender. William Dwight Billings was an American ecologist. Billings was one of the foundational figures in the field of plant physiological ecology and made major contributions to desert and arctic ecology. Prince Bertil, Duke of Halland, was a member of the Swedish royal family. He was the third son of King Gustaf VI Adolf and his first wife, Princess Margaret of Connaught, as well as the uncle of King Carl XVI Gustaf of Sweden, Queen Margrethe II of Denmark and Queen Anne-Marie of Greece. From 1973 to 1977 he was heir presumptive to his nephew King Carl XVI Gustaf and the Swedish throne. Peter Cain was an artist who is best known for his meticulously executed paintings and drawings of surreal and aberrant versions of automobiles. His style has been said to combine aspects of Surrealism, Photorealism, and the art of James Rosenquist. He is of the same generation of painters who came to prominence in the 1990s such as Elizabeth Peyton, John Currin, Peter Doig, and Karen Kilimnik. He died at age thirty seven of a cerebral hemorrhage having completed sixty-three paintings over the course of his short career. He was represented by the Matthew Marks Gallery in New York during his lifetime. March 28 is the 87th day of the year in the Gregorian calendar. 278 days remain until the end of the year. October 14 is the 287th day of the year in the Gregorian calendar. 78 days remain until the end of the year. ↑ "Kathryn Beare". All-American Girls Professional Baseball League . Retrieved 2019-03-29. ↑ "Catherine Blumetta". All-American Girls Professional Baseball League . Retrieved 2019-03-29. ↑ "국내 첫 프로권투 세계챔피언 金基洙씨 별세". ↑ "Obituary: James Stewart, the hesitant hero, dies at 89". The New York Times , July 3, 1997. ↑ Zoltán Czibor, Sports-Reference / Olympic Sports. Retrieved 2019-03-03. ↑ "Richard Mason, 78, 'Suzie Wong' Author". ↑ "Leola Hay". All-American Girls Professional Baseball League . Retrieved 2019-03-29.